Rung to remember 2nd Lt. Bernard R H Carter, 13587, 19 Training Squadron, Royal Flying Corps, who died on 7th November, 1917 at Llangefni, Anglesey.Bernard was the son of the then Rector of Slimbridge, a member of G&B D A and a ringer at this tower. First submitted Tuesday, 7 November 2017 at 20:38:13 by Ian P Unsworth. 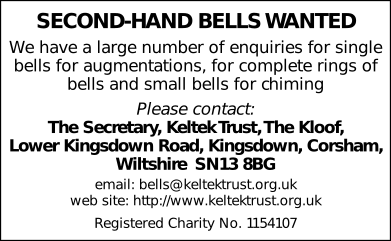 Sent for publication in The Ringing World on Tuesday, 7 November 2017 at 20:38:34, and printed in one of issues 5561 or 5563.